Yesterday I introduced you to a barefoot runner of the 1960s, Bruce Tulloh. While researching that, I happened upon another one, from the 1970s. When I write these entries, I often try to do a bit more than just point you to an article that I’ve come across on facebook (or elsewhere). I’ll do a bit of work to see what else I can find. That’s how I came across Marcus Clarke, the son of Ron Clarke. Ron Clarke was another Olympic athlete, winning a bronze in the 10,000m at the 1964 Summer Olympics. Ron is Australian, and in fact is currently the mayor of the Gold Coast in Queensland. I wonder if he encountered Bruce Tulloh at one of the Olympic venues and it influenced how he trained his son. 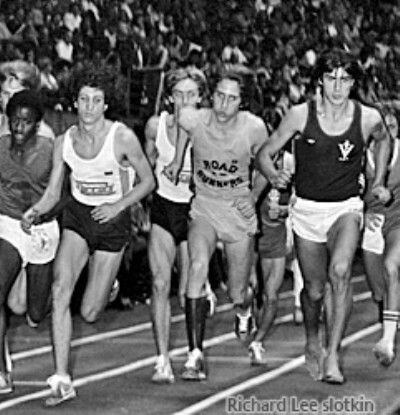 So, here he is at the start of the 1979 L.A. Times Invitational. A few years earlier, while still in High School in Melbourne, Marcus was a pretty good runner. Here’s a little blurb about him for a high school championship (In “The Age” of Melbourne, Oct. 27, 1977). Clarke, 17, is likely to be the outstanding middle distance performer and will go close to breaking the under 17 1500 metres record. The record is 4:07.7, but Clarke has a best time of 3:59.0. Clarke will run in bare feet on Saturday. He has trouble getting spikes to fit — his right foot is size 14 and his left foot size 13 — and would prefer to run in bare feet until the correct spikes are available. So, it looks like those “spikes” still weren’t available two years later! Or maybe it was just an excuse to run barefoot. That same paper also has column by his father. When I was a lot younger almost everyone raced barefoot in school sports. The kid who owned a pair of running shoes was a rarity. The shoes themselves were completely unbalanced. Their uppers were very light but the soles were made from layers of thick leather so that the spikes themselves would not be pushed back into the balls of the feet. It was like running with weights strapped to the soles of your feet. Nevertheless I knew of no international athlete that ran barefooted; back then I always wondered why. Running without shoes has many advantages. Obviously, it is much lighter, but that main gain is in the actual freedom it allows in the action of the foot. The toes, especially, grip the track well and the whole foot rolls allowing the grip and leverage to be retained right through the the last thrust of the stride. There are two problems: grip and friction. The grip of spikes digging into the track was always regarded as a great advantage. The shorter the race the longer the spikes in order to gain maximum grip and leverage. Now the manufacturers tell us this was a fallacy. The latest, most expensive running shoes have claws rather than spikes because, it is claimed, energy is wasted extracting the spikes from the track. The old ¾” sharp spike has been replaced by small, stubby metal pimples that grip rather than penetrate the running surface. As well the uppers are shaped to fit the foot like a glove. So the move is right back to making the racing shoes as much like a bare foot as possible. The only real problem with bare feet is the friction of the surface on the soles of the foot. If the feet are tough enough there is no concern; and they would be if we were not so keen to shoe our youngsters. This represents a real change of face for me; I spent years arguing the merits of shoes but the more my son runs bare footed the more advantages I can see in the practice. Actually I did a lot of my training at the Caulfield racecourse unshod but only raced occasionally that way. My first mentor, Les Perry, won an Australian 3 miles title racing in bare feet and rarely ran in spikes. He was the first top class athlete I had seen racing that way. But he was quickly followed by others. Dave Stephens, our first distance world record holder, known as the Flying Milkman, ran much better without spikes. Bruce Tulloh won the 1962 European 5000 metres championship on cinders in bare feet and never raced in spikes on any surface; Abebe Bikila won the 1960 marathon running barefooted through the streets of Rome and, in doing it, ran 2 minutes faster than any previous marathoner had ever recorded. Neville Scott and Jim Hogan were two other top class runners in my day who never wore running spikes; at the time I thought they were crazy. Now I’m inclined to think that what comes naturally may be the best way of all. It’s interesting that the article sounds like it could have been written today, not 35 years ago. I really liked the excerpt from “The bare facts of running.” Shoes seem to more or less successfully solve some of the problems they themselves create.